All in One fomod installer now available! Think I'm done with this mod, very happy with it. Feel free to suggest anything i'd be glad to change something if needed. strange , it,s not working for me , when using Rw2 , even tried turning off sse engine Fixes Waterflow Feature , no joy . This is perfect for me. Thank you so much for you great work. Looks good except for I'm getting weird reflection issues that look like black blocky tree LODs and water seams that seem to go from smooth water to normal RW2. Using the water seam fix as well. I'll mess around with it some more and see if I can't figure it out. Thank you. Can u post a picture of your other problem? i had black blocky reflections from trees addon mod from skyrim LE when i forgot to transform the meshes with nif optimizer, then it looks normal, maybe you got a similar problem. 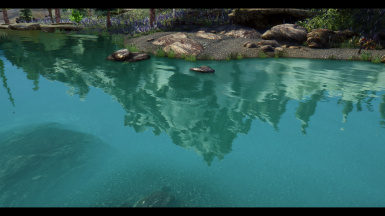 The black out line on reflection of trees is an alpha bug there is a fix for this use SSE engine fix its also built into ENB but only use one at a time . The difference in reflection, between BC7 and BC5/DX5 is great, BC7 is so much better because more colour depth, and nearly no artifacts, i have combine this with Pfuschers improved Water Performance, BC7 too, it looks fantastic and realy great performance, thank you. 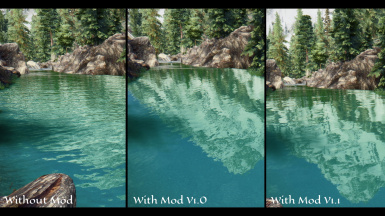 I did the same looks very nice reflections have a substantial improvement no need for .ini tweaks now, I use ENB fix (SSE engine fix has this fix also) for trees reflection I turn sky reflections off. & I make sure RWT2 isn't overwritten by any other mods that edit the same world space & it loads first. 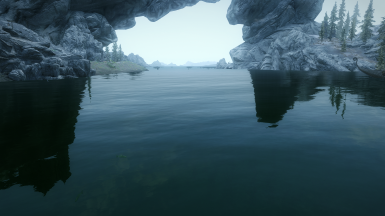 By far the most realistic I have seen, your mod captured the real movement and looking/reflection of water! Either this mod doesn't work anymore or 1.2 is the problem, my water is still RW2 but its not smooth. Like in the pictures. Very nice mod, thanks for sharing. One thing, there is places below waterfalls and close to fast moving water where the water get too still and smooth. 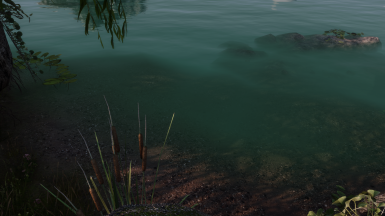 Is this been worked on, to improve places that should have more rough water? Except from that, great mod. Not planned right now as I'm working on a different project. If you're using the standalone version try replacing the "riverflow.dds" with a different texture more suitable for your taste , that should work. Hodilton was surprised that this mod can boost your fps up a bit! Besides this seems fascinating to my eyes so I'll definitely try.